Located on the banks of the Merderet River, Ramelle was a small French village which became an important target for both Allied and German soldiers following the Allied landings at Utah and Omaha beaches on June 6th, 1944. The Germans needed control of the village and its bridge to move armor up the Cotentin peninsula in order to defend the port of Cherbourg, while the Allies needed to prevent that, and to maintain control of the area in order to maintain a link between forces that had landed at Utah and Omaha. 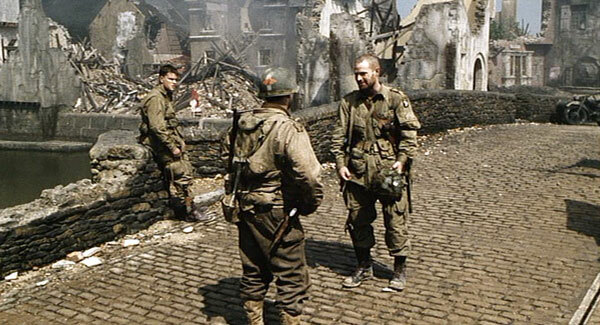 Sometime after June 6th a group of paratroopers from the 101st Airborne Division, including Private James Ryan, were assembled in order to defend Ramelle's bridge, or if necessary, destroy it. This group withstood an attack from German forces that included significant 88mm artillery fire which decimated Ramelle and killed Captain Jennings, the paratrooper's commanding officer. Left in charge of a small group of men with limited weaponry, Corporal Henderson awaited relief and/or reinforcements. On June 13th, while scouting a nearby field, Henderson, Ryan and Private Toynbe destroyed a German halftrack that was part of a 2nd SS Panzer Division recon element. They were assisted by the unexpected presence of a squad of Rangers led by Captain John Miller. The Rangers were searching for Ryan, who was to be returned home because of the recent loss of all three of his brothers in combat. Ryan refused to abandon his fellow paratroopers, and Miller decided to take command and prepare the village for an expected German attack. Setting up defensive positions and creating sticky bombs for use in disabling tanks, the Rangers and paratroopers waited for the imminent arrival of the Germans. Attacking with two Tiger I tanks, two tank destroyers and assorted infantry, Germans of the I SS Panzer Corps entered Ramelle. The American troops responded with planted explosives, machine gun and small arms fire, and their makeshift sticky bombs. Although they were successful in knocking off the tracks of one of the tanks, and in taking out one of the tank destroyers, the Americans were outnumbered and had to fall back to a position on the opposite bank of the Merderet that had been dubbed the "Alamo." From here Ramelle's bridge could be destroyed with explosives that the paratroopers had planted as a contingency plan. As a mortally wounded Captain Miller prepared to detonate the explosives, Allied ground and air forces arrived and drove off the German attack. The paratroopers had suffered many losses in the battle, and Miller's squad had been all killed except for Private Richard Reiben and Corporal Timothy Upham. 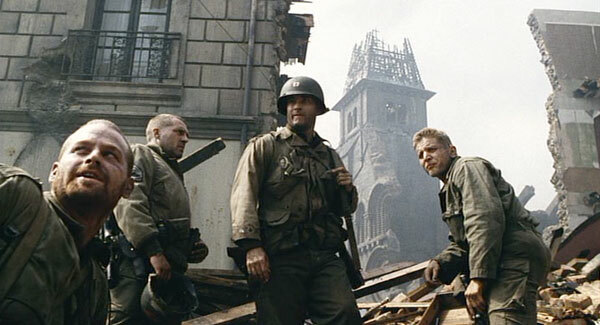 Through the efforts of Miller's men, Private Ryan's life had been sparred and he was eventually returned stateside. 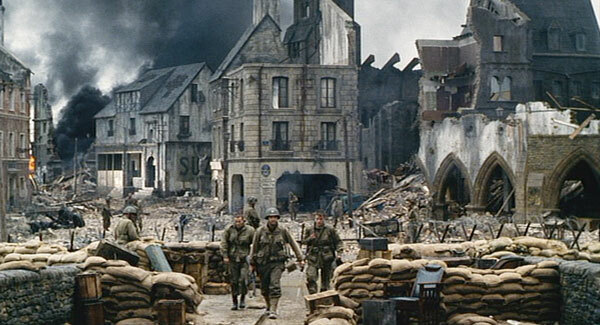 Unlike most of the locations in Saving Private Ryan, Ramelle is not a real French village. 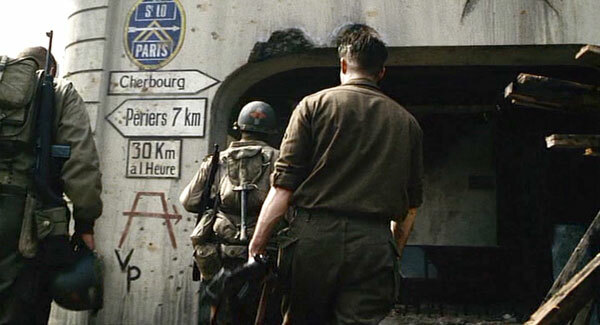 The set for Ramelle was built at an abandoned airfield at Hatfield, England, and was actually part of a larger set that included the village of Neuville-au-Plain. Careful planning and camera work allowed this dual set, separated by a three-foot deep canal (the Merderet River), to be used for two separate villages. 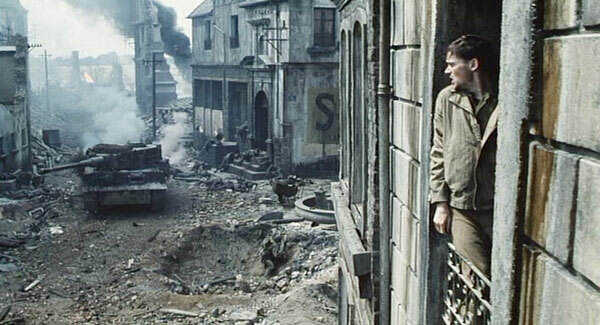 The canal and bridge so prominently seen in the Ramelle scenes are never seen in the Neuville scenes, although portions of the Neuville set can be seen during the Battle of Ramelle. 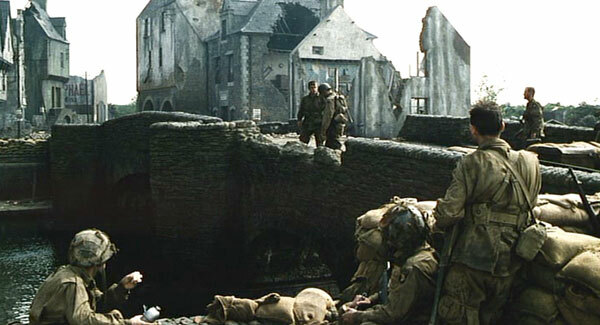 "The Alamo," a small-bombed-out building, was actually located on the Neuville side of the set. 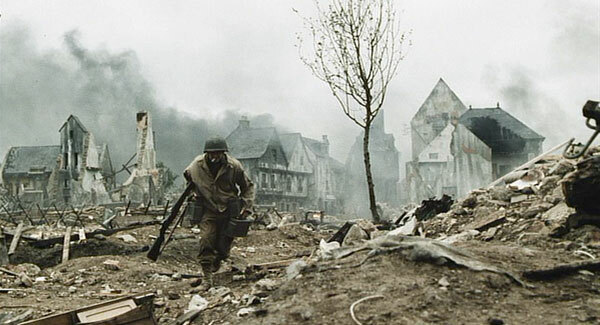 One of the most heavily criticized scenes in the film, the Battle of Ramelle is not a textbook example of how a German unit would attack a small defending force in the rubble of a village. 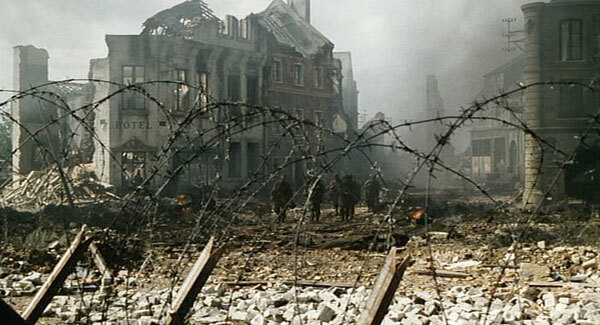 The closing battle is designed to support the plot and the drama, and not represent a history lesson on German tactics. A good example is the belltower that Jackson and Parker set themselves up in. Although the structure had obviously already been hit before, the tower itself was still intact and made a perfect sniper's nest. Before entering the village the Germans should have leveled that tower in order to deny their defender's a place from which to fire on them.